There are food and wine pairings so singular, it’s hard to stray from them. Like chèvre and Sancerre in France, tomato sauce and Sangiovese in Italy, or paella and Tempranillo in Spain. Once you partake, the flavors are etched in your mind. They meld with the people and place. I’ve caught myself reminiscing… remembering that meal, that wine, that town. Remembering that Tortilla Española and French wine pairing. There’s a reason regions make certain food to go with their wines. This month the French #Winophiles break that mold, exploring food that pulls flavors from different cultures then pairs them with French wine. I headed to Spain and chose a dish that’s easy to make. At it’s simplest, it pairs with many French wines. From there, you can add components to transport the flavors of this country dish to different cultures. There are few pleasures as enjoyable as eating a Tortilla Española while enjoying a glass of wine. 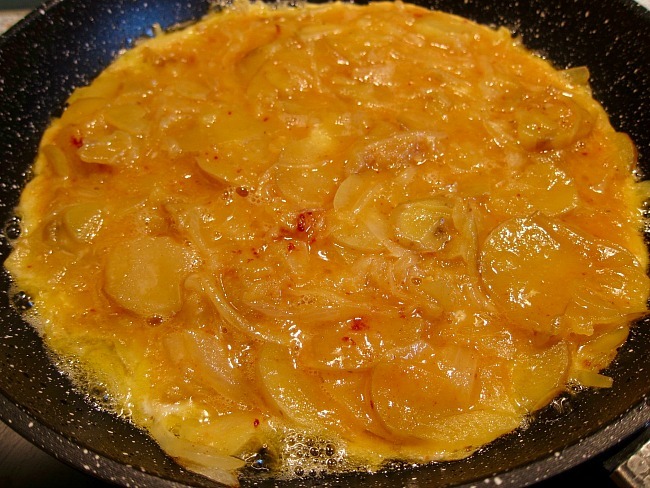 The standard Tortilla is simple: pan fried potatoes with onions, eggs, and salt. The potatoes are cooked in oil, which coats your palate and adds richness and mouth feel. My favorite way to increase its unctuousness is by adding additional items: caramelizing the onions, adding Spanish Smoked Paprika or Merken, an Argentinian spice blend with a smoky side, or topping a tortilla with avocado. And a trick is to error on the side of undercooking so it’s oozy in the middle. Once taken off the stove it will firm a bit when cooling and if reheated, won’t be dried out. From France I look south towards the Corbières AOC in the Languedoc-Roussillon region or the Bandol AOC in the southern Rhone Valley. Why this works: Pan-frying the Tortilla creates satisfying, homey flavors and increases richness. The wine is fresh and crisp with acidity that cuts through the fatty components of the dish, balancing them delightfully. 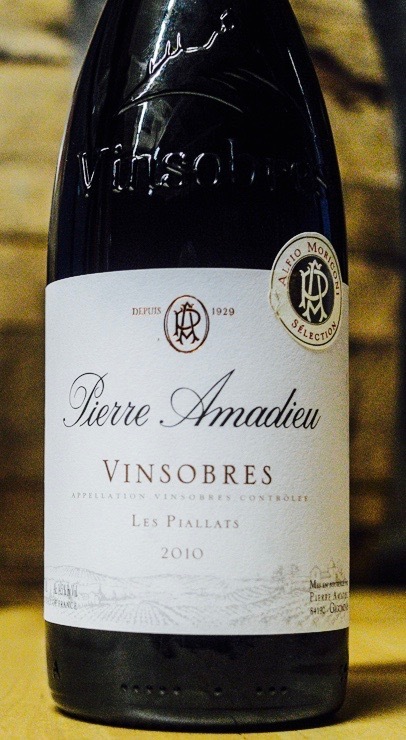 Preferably from Entre-Deux-Mers, the wines are mostly un-oaked or minimally aged in oak, and with no, or minimal lees stirring. Graves is another area that can have a touch of oak, and some wines spend time aging on lees. Why this works: The two main grapes in White Bordeaux are Sauvignon Blanc and Semillon. These are nothing like the Sauvignon Blanc from the Loire Valley or as pungent as those in New Zealand. Sauvignon Blanc brings fresh crispness and acidity (citrus) while Semillon adds a slight creaminess and fruity/floral aromas. These wines are crisp with a soft richness; their flavors play on the rustic Tortilla aspects, especially if you add caramelized onions and sliced or mashed avocado. Why this works: Grenach, Syrah, Mourvedre, Cinsault and Carianne are primary grapes in these wines. When made in a medium style, they contain fruity, bright richness with an earthy, herby, and some times smoky component. The flavors and medium tannins work well with the rustic Tortilla. There are many great value wines in this area, including these three for any day of the week drinking. The nice thing about the Tortilla Española is its versatility. If you prefer red wine, use the Smoked Paprika and/or Merken. A drizzle of quality olive oil will heighten the pairing as will Romesco Sauce. Here’s a great Romesco recipe from Elise Bauer at Simply Recipes. If you prefer Rosé, throw in lots of caramelized onions and top a piece of warm tortilla with a mild Spanish goat cheese like Monte Enebro, or go the earthier route with Manchego. And if White Bordeaux is speaking to you, add the onions, cook your tortilla less, so it’s oozy and moist, and serve on a slice of toasted crostini. Here’s an easy Tortilla recipe that’s sure to please. But remember- take a peek at the food and French wine pairings from the other French #Winophiles below! 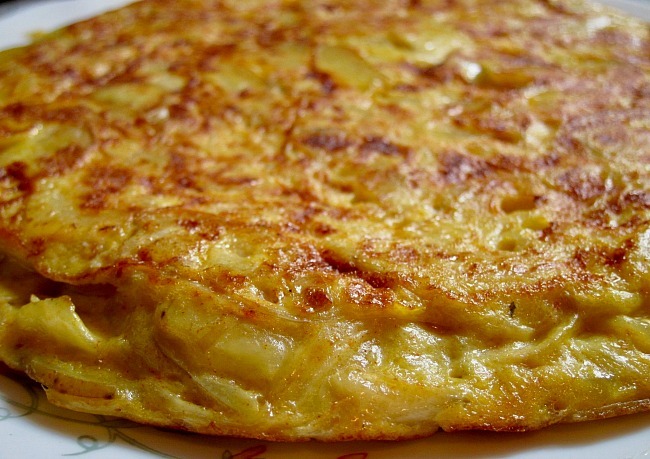 The Tortilla Española is as versatile as delicious- enjoy as a Tapa, lunch, brunch or dinner. Peel the potatoes and rinse them under cold water. Pat the potatoes dry then thinly slice (a mandolin works great). Put them into a large bowl, sprinkle with salt, add the onions and mix well. *If caramelizing the onions, see note below. Heat a ½-inch of oil in a large frying pan over medium to medium-high heat. Carefully place the potato onion mixture into the pan, spreading them evenly. When the oil is hot, add the potatoes and add more oil if necessary until they are barely covered. Cook the potatoes, stirring here and there, for about 15 minutes or so. If you can poke a piece of potato and it easily breaks in two, they are done. While the mixture is draining, beat the eggs in a large bowl and season with salt and pepper. After a few minutes, add the potatoes to the egg mixture and stir well. Pour 1 to 2 tablespoons of oil into 10-inch, non-stick frying pan and heat on medium heat. When hot enough, stir the potato-onion mixture once more in the bowl and pour into the pan, spreading evenly. You may need to turn heat to medium-low. Allow the egg to cook around the edges. Then, using a spatula, carefully lift up one side of the tortilla to check if the egg has slightly browned. The inside of the mixture should not be completely cooked and the egg will still be runny on top and in middle. Take a large plate and put it over the pan, put the palm of your hand firmly on the plate and flip quickly! Slide the tortilla (which should still be a bit runny, that’s good) back into the pan. Use the spatula to shape the sides of the omelet if necessary. Let the omelet cook for three to four minutes. Turn the heat off and let the tortilla sit in the pan for two minutes. Slide out of the pan onto a serving plate and enjoy with a glass of your favorite wine. *If caramelizing the onions, fry in a separate frying pan over medium low heat for about 10 minutes until they begin to caramelize and turn brown. 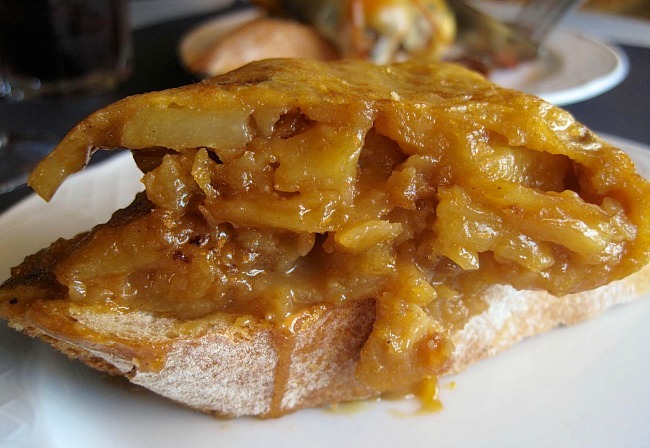 You will cook the potatoes without the onions, then top a tortilla slice with caramelized onions. Check out where they went! Michelle from Rockin’ Red Blog asks Do Empanadas Bordeaux? Connecting these food/wine comparisons is such an art… and fun to read. More fun to try. Thanks for sharing, Lynn. I love the idea of a dish that pairs so readily with such a wide variety of wines! I love the versatility of a tortilla Jeff. Simplicity at its best. A great post. Love that you tried the dish with different wine and offered some small changes that would make it pair better with one type of wine or the other. Well done! Such clear explanations of why certain wines pair better with specific ingredients. Your post shows just how many options we have when putting a dish together and selecting a wine to accompany it. And the recipe looks delicious! 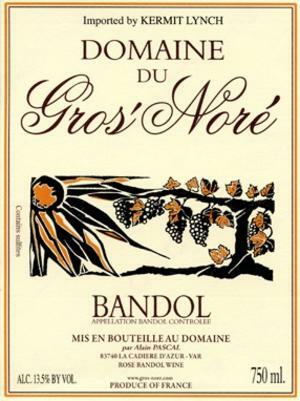 Bandol Rosé can be so great. Granted, it is a bit pricey but the flavour intensity and versatility with all kinds of food make it one of my favourite summer drinks. I totally get why you matched it with the tortilla. 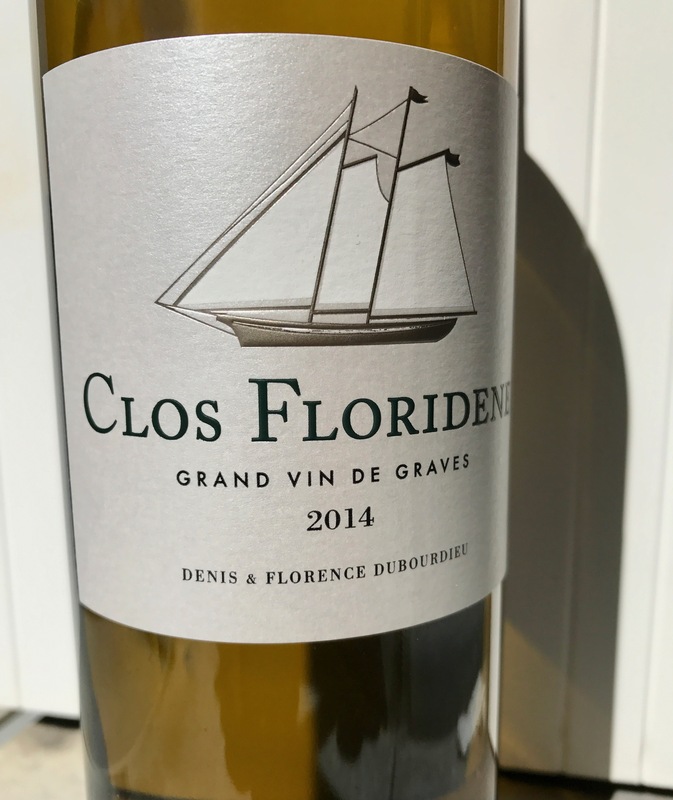 The wines are also very good for tucking away in the cellar, we did a tasting a while back with the highlight being a Gros Noré 2005, utterly fantastic! I’m tempted to be in love with Bandol Rosé Peter, but as you indicate, it can be pricey. Thanks for the tip re putting in a cellar, I’ll have to grab one and do so- Cheers! Wonderful food and wine pairing post. I especially like how you tweaked the ingredients in the tortilla to pair with a variety of wines. Simplicity at its best… and then of course with wine! I will make your tortilla and try your pairings. Cheers! If you make the tortilla, you’ll have to let me know how it turns out, and the wine your pairing. Yes to simplicity!